Welcome to this my thirty-fourth electronic news bulletin, and the last of 2009. Remember, you can always contact me directly if you have any questions for me. The National Pandemic Flu Service is a new self-care service comprising a dedicated website. It will allow people to check their symptoms and, if necessary, get a unique number which will give them access to anti-virals at a local collection point. THERE were cheers in the Commons and in bingo halls across South Cheshire when the Chancellor announced a Government U-turn on the controversial Bingo Tax hike. In his Pre-Budget Report, he said the tax on bingo would be lowered from 22% to 20% from April 1. Earlier this year, the Budget raised the level of taxation on bingo from 15% to 22%. It made bingo the highest taxed form of soft gambling in the UK, as tax on other forms was left at 15%. The announcement sparked outrage in bingo clubs, and with the 5-6 million bingo players up and down the country. Crewe and Nantwich has some 20,000 players – including Mr Timpson. Leading European gaming business Rank Group, along with Gala Bingo the Bingo Association, Castle Bingo and Mecca Bingo, who front the campaign, are just some of the organisations who started campaigning against the increase in bingo duty. An online petition not to increase bingo taxes was signed by 2,578 people, and player and members of the industry protested outside Parliament on July 1st. Many MPs, including Crewe and Nantwich’s Edward Timpson who attended the protest, also lent their support to the campaign to scrap the tax. In May Mr Timpson spoke out in the Commons against the tax, declaring: “Bingo halls are essentially clubs for people. We should not deny them that opportunity in an attempt to claw back what is a miniscule amount compared to the overall deficit in the Government’s finances. The industry has reacted positively to the Chancellor’s latest announcement, Chief Executive of the Rank Group Ian Burke said: “Today’s announcement is a step in the right direction. And Paul Talboys of the Bingo Association called the move “a pleasant surprise”. Mr Timpson echoed these sentiments. “I’m pleased that after months of campaigning and lobbying both in and outside of Parliament as well as in Crewe itself, the government has belatedly accepted that bingo is being unfairly taxed. © 2009 Trinity Mirror North West and North Wales Ltd.
CREWE and Nantwich MP Edward Timpson has this week welcomed news from the Secretary of State for Children that the Government has backtracked on its plans to force anybody with any contact with young people to have criminal checks. The so-called “vetting and barring” scheme faced widespread public opposition when it emerged that it could potentially target anyone coming into contact with children – including parents organising school runs. MPs were sent a letter last week following recommendations made in a report by Sir Robert Singleton. The revision means the number of people required to register will fall from 11 million to nine million. Mr Timpson said he had been contacted by a number of people in Crewe and Nantwich concerned about the checks. “A number of constituents have contacted me in the last few months to make their concerns about this unpopular scheme heard,” he said. “ I am very pleased that the Government has seen sense and listened to our opposition on this matter. Crewe and Nantwich MP Edward Timpson is the new chairman of the All-Party Parliamentary Group on Adoption and Fostering. The group is a communication forum for MPs and outside organisations with a specific interest in adoption and fostering policy. Mr Timpson was selected because of his wide experience in the field, gained from an extensive background in family law, as well as the fact that his family members have adopted over 80 children between them. Speaking after his first meeting, Mr Timpson said: “I feel privileged to have been asked to chair this important group. “Hopefully with my knowledge of the area, I can lend some insight to the issues. Edward Timpson, MP for Crewe and Nantwich, says Britain will be paying for Labour’s mistakes for years to come. He has responded to the Government’s new tax and spending proposals – the so-called Pre-Budget Report – by warning of Labour plans for higher taxes and record levels of national debt included in the small print. Mr Timpson highlighted several of the new taxes including National Insurance increases for workers, meaning a smaller pay packet for anyone earning £20,000 or more, and higher Stamp Duty, meaning the average first-time buyer will now pay £1,745 in duty. Local Mp Edward Timpson says the importance of people staying warm in their homes over winter can’t be over-emphasised. New figures show ‘fuel poverty’ is at its highest level since 1998. The figures reveal that 13.3% of households in Crewe and Nantwich live in fuel poverty and that during the 2007-2008 winter there were 50 ‘excess winter deaths’ attributed to the cold. Anyone in trouble with their energy bill can call the Home Heat Helpline on 0800 33 66 99. CHESHIRE MPs have held talks with the North West Ambulance boss to address the service’s poor response times in the rural area. MPs Stephen O’Brien MP (Eddisbury) and Edward Timpson (Crewe & Nantwich) had a “constructive” discussion with ambulance chief executive Darren Hurrell at The Swan in Tarporley. Last year the service only managed to reach 67.31% of life-threatening calls within eight minutes in Western Cheshire. The MP has been told of cases where it has taken 40 minutes or a hour for an emergency ambulance to arrive which he dubbed “unacceptable”. Mr O’Brien, who was joined at the meeting by Central and Eastern Cheshire Primary Care Trust chief executive Mike Pyrah, has asked for a postcode break-down of incidents to gain an insight into what the service “can and cannot achieve”. The MPs support the idea of promoting volunteer First Responder scheme in remote areas to “plug the gap”. But Mr O’Brien continues to argue Cheshire First Responders, who are trained to a higher level than colleagues elsewhere, should be allowed to retain their skill base enabling them to deal with a wider range of incidents. A Care Quality Commission report showed the North West Ambulance Service last year narrowly missed the target of responding to life-threatening calls across the region within eight minutes, 75% of the time, and only reached serious calls within the 19 minute target, 87.62% of the time – the target being 95%. Meanwhile, the North West Ambulance Service is looking for members of the public to sign up for the new Community First Responder team in Tarporley. Residents of the village, which is home to 2,500 people, would need to commit four hours per week or 16 hours a month if they choose to join the voluntary service. Community First Responder groups are trained to deliver basic life support and defibrillation to heart-attack patients. Members will not be sent to incidents considered dangerous, such as an assault or road traffic accidents. For further information visit www.nwas-responders.com or call 01772 903 989. In the centre of town, it was revealed that Lyceum Square would have a facelift - including a swanky new cafe. The project has proved troublesome, and just this week local MP Edward Timpson met with market representatives to discuss the situation. Most of the outdoor stalls will move (rather appropriately) to Market Square when the refit starts in February/March 2010. Not all are happy! A Nantwich pupil scooped first prize in a Christmas card competition run by MP Edward Timpson. Laura McMeeken, of Wyche Primary School, was judged overall winner and her picture will adorn the front of Mr Timpson’s Christmas card. Local primary schools were asked to get their pupils to enter by designing the card’s front page. Prizes were presented at Crewe’s Municipal buildings with parents in attendance. There were nine runners-up from primary schools across the constituency. Runners up were Tendai Mutanda from Brierley Primary, Michael Brindley from Bridgemere Primary, Aaron Evason from Hungerford Primary, Cameron Young from Leighton Primary, Ryan Stacey from Stapeley Broad Lane CE Primary, James Briggs from St. Mary’s Church Primary, Toni Wilson from Underwood West Primary, Hannah Ingram from Weaver Primary, Diego Fryer from Wistaston Green Primary, and Kayley Price from Wyche Primary. Police Officers say the case of a man who is beginning a lengthy prison for burgling 32 homes in Crewe underlines their "Lock your doors" warning. All the burglaries carried out by Stephen Crimes were sneak-ins. He simply walked into the houses through unlocked doors. Crimes, aged 36, was jailed for four years and three months by a judge at Chester Crown Court. He had pleaded guilty to two charges of burglary and asked for thirty similar offences, plus one offence of stealing from a car, to be taken into consideration. All the burglaries were committed while Crimes was staying with various friends and acquaintances in Crewe. He had a home address in Tatton Close, Winsford. Detective Constable Darren Hebden said, "In all these cases he simply walked into the house and took items he could carry easily, such as laptops, mobile phones, ipods, cash and cards. "He specialised in the sneak-in burglary and he is not the only criminal doing that. Currently a third of all burglaries in this area are carried out by people who wander the streets and nip into people's gardens trying doors until they find one that is unlocked. In most cases the occupiers will be in bed, but even if they are in another room downstairs the burglar will take what he can and make a quick exit. "We can only repeat our warning about this and encourage people to get into the habit of keeping doors and ground floor windows locked at all times. A check-round before you go to bed is vital, too. Crime prevention doesn't get much simpler than that! "The sentence on Stephen Crimes means that a professional criminal with a long record will be removed from the streets for some time. The courts, like Cheshire Police, take burglary very seriously and only the fact that he was frank about the offences he had committed saved him from an even longer sentence. "We and the rest of the Criminal Justice System are doing a lot of work to protect people's homes from burglars, but the responsibility does not stop there. Everyone has a duty to take reasonable precautions to protect their home." 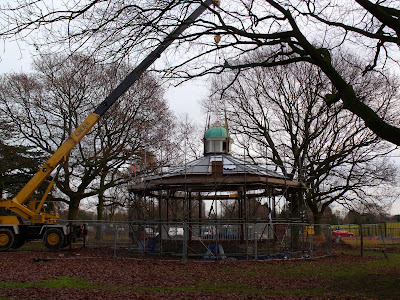 Monday saw the return of the Bandstand dome from being restored off site. It looked very good with the top done in gold leaf. The main posts have been restored and put in place and much of the roof has been done. The bandstand should now be finished in January 2010. Full details and more pictures on the main Queens Park Website The first bridge was due this week but has been put off until January but the whole park is moving a head at a great rate of knots. Specialists will give crime prevention advice in the town centres, and hand out free bag alarms and purse bells. Crime Reduction Adviser Mark Cotton said, “Pickpockets and bag snatchers see the Christmas shopping period, and especially the last few days of it, as a boost to their own particular trade. “They can work among big crowds of people, and they know many of the shoppers will have their minds on other things. They can take full advantage of a lapse of concentration and a bit of carelessness. “Police Officers and partners are putting a lot of effort into tackling town centre crime. Some officers are out and about in uniform as a deterrent. Others, in plain clothes, are identifying and arresting shoplifters and purse dippers. But shoppers themselves can beat these thieves. It just means taking a few simple precautions. Those precautions will be highlighted by Mark and the Watch Co-ordinator, Hayley Goodwin, who are setting up advice stalls in both town centres. Mark said, “We will also hand out some bag alarms and bells. These will be on a ‘first come, first served’ basis and we will limit them to one per person. They are a useful crime prevention device. Anything which can raise an alarm if a thief tries to take a purse or bag, is a useful last line of defence. “Keeping an eye on your cash and cards and making sure they are somewhere which is difficult for a thief to reach, is something we should all do at all times. “Other criminals are busy at Christmas time, too. We are warning people who are out buying presents not to leave them on view in their cars. We have distributed postcards to shops which have a cartoon picture of a thief eyeing up cars loaded with presents, and carrying the slogan, ‘Display and You’ll Pay’. v Walk with confidence. Avoid looking distracted or confused. Thieves target people who appear vulnerable. Be aware of what is going on around you. v Be careful in crowded areas. Thieves often bump and jostle people as a distraction technique. v Avoid carrying your wallet in a back pocket. v Carry your bag and purse in front of you where you can see it. If the bag has a zip or flap, keep it closed. v Never leave a purse or bag unattended on a supermarket trolley or shop counter. v Be careful at cash machines. Pickpockets watch people collecting money to line up potential targets. Police Officers are warning people across East Cheshire, “Make sure your Christmas presents are not a twelve-day wonder”. They say many recent burglaries have been linked to a lack of basic home security and people need to be more careful. Detective Inspector Nigel Groom, in charge of Cheshire Police Eastern Area Pro-Active CID said, “The New Year period and January traditionally bring an increase in the number of burglaries. Ask yourself how you will feel if the gifts which bring so much pleasure to you on Christmas morning are soon in the hands of a stranger who will probably turn them into cash to buy drugs? “That new Wii console or laptop, or that glamorous jewellery the wife had for Christmas are all attractive to a criminal. So are some of the electronic games and other toys you bought for your children. “At this time of year burglars have long hours of darkness to help them in their work. We are also finding increasingly that people are failing to take the most elementary precautions against burglary, such as locking doors. “One in three of the area’s burglaries at the moment is a sneak-in. The criminal simply walks through an unlocked door or climbs through an open ground-floor window. Some of these burglaries are in the daytime when the family are in the next room. Others are at night when the family are asleep. Some people go to bed without locking up! “In the past few weeks we have arrested some of the most prolific burglars but everyone has a duty to take reasonable steps to protect their home and their property. “The basics are very simple. Firstly, make sure you keep outside doors locked whether you are in or out of the building and always check the locks before you go to bed. If you have a security alarm, make sure you it is set at night and whenever you go out. “Bear in mind that a house that might be occupied is generally less attractive to a burglar. Leave a radio on when you are out and put a light on if it’s dark. Invest in a couple of timer switches to operate the lights if you are out for a long time. “Keep an eye open for unexpected activity in your neighbourhood. Burglars will usually spend some time looking around to identify the most vulnerable property. If you see anything suspicious call the Cheshire Police Information Line 0845 458 0000. “In some cases your Christmas present may not have been for the home. If you received a sat nav or another car-based device, like a CD player, leaving them in the vehicle when you park is another way to hand them to a criminal. “If you want to keep them, take them out of the car when you park, and make sure you don’t leave behind the sat nav cradle or other signs that a sat nav was fitted. A thief can do a lot of damage breaking into your vehicle if he believes that a sat nav may be inside. “If possible park in well-lit areas which are covered by CCTV and be aware of what is going on around you. Make sure you are not being watched. The meeting was poorly attended maybe the dark cold night had something to do with it. It was an interesting meeting with presentations by Lost Arts who are doing the Bandstand. We were shown the new design for the Cafe and Bowling club. Its hoped this can go before planning before Xmas and then tenders can be sought in the new year with work starting in March time. One exiting piece of news is that the play area has been brought forward due to complaints and the horse and spider falling apart. Designed by children it will be divided into two areas one for very young children and one for older children. Its hoped it will be ready for easter next year so thats good new all round and it shows the council do take notice of people. Its still hoped that the lake will be finished by March next year and open to the public at long last but some paths will have to be closed in the future for new paths to go in. Tolent have been on site for 11 wks following acceptance of their tender. There has been a 6 day delay due to bad weather. 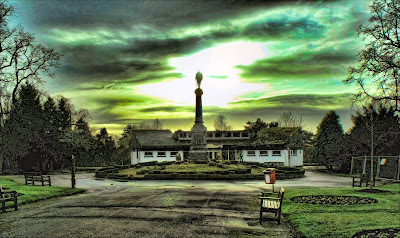 The Tolent site will close at Xmas from 18th Dec for 2 wks. Works have focused on lake edges and islands plus preparations for bridge abutments and foundations etc. The Inlet Bridge at the Tipkinder end of the lake is the first bridge to go in and it will arrive on site Tue / Wed next week, preparation works are ongoing. All Lake Inlet walls have been repaired and repointed. Gabion baskets all around the Burma Star Island to be faced with stone blocks. A stone sample has been agreed. East and West Island walls have been completed but may be raised to allow fluctuations in water levels. Works to modify bridge abutments are underway. Broadwalk Bridge works on site for 3 days next week. This will be the last and largest bridge to be positioned estimate end of Feb. Footpath links will need to go in to facilitate all bridges. Coronation Bridge - Completion is expected by the end of January - together with Burma Star Bridge. • Access roads require improving. • Design modifications and approvals. • Correction of Wrekin works where required. Slight slippage of works largely due to discoveries on site and additional higher quality finishes which have been agreed. Matching of sandstone to closely match the original has been very successful. A detailed update and explanation of how these structures are restored will be given by Domenic of Lost Art. The completion date will now be end of January 2010. NB. Ian will be providing a detailed update on the Lake and Bridge works and progress with the bandstand. Rocking horse and spider's web removed due to safety implications see above. An exciting consultation took place involving the Sir William Stanier Community School and their feeder school's i.e. children talking to younger children. The selection and design process is well underway. Additional monies via ex Mayor will be allocated specifically for the disabled element. A contractor will be selected early spring2010. Curved railings are to be completed early in the New Year and the Gates will be the very last item due to heavy construction vehicles accessing the park to install the bridges. A very successful community Youth Christmas Lantern Procession took place last Sunday. It attracted approx 300 people; we were very pleased with the response. Pupils of Pebble Brook, Monks Coppenhall, Edleston Road and Wistaston schools all participated. As Christmas and New Year approaches many of us go out with friends, family and workmates to celebrate over the festive period. Whilst out and about take a few sensible, generally common sense precautions, to ensure that you and your possessions stay safe over the party period. It is important to plan ahead for a night out. Decide how you are getting to the venue and home again afterwards before you leave home for the night. Always make someone aware of where you are intending to go and when you plan to return so someone else is aware of your plans for the night. If driving: 1.) Keep your car in good condition and ensure that you have enough petrol for your journey. 2.) Try to park in well-lit or busy areas. If parking during the day, think about how the car park will feel after dark. 4.) Never drive if you have been drinking and do not accept a lift from someone who has. Public transport: 1.) Try to wait in busy and well lit areas. 2.) Sit near to other people, near the driver if you are on a bus or near the guard if on a train. Taxis: 1.) Always pre-book your taxi at the start of the night and ensure that it is your taxi before getting into it. 2.) If you have pre-booked your taxi keep a note of the firm you are using and their phone number and leave it with a family member or friend. 3.) Always have the number of a couple of reliable taxi firms handy/on your phone. 4.) Avoid the temptation to take a minicab on the street even if you are having difficulty getting a cab - it is illegal for most minicabs to take passengers who have not pre-booked. 5.) If in any doubt, don’t get in the taxi. 1.) Keep an eye on your valuables. Don’t leave your handbag over the back of your seat and keep your purse and wallet close – busy venues can attract pickpockets. 2.) No one will look after your valuables as well as you! Don’t rely on someone else to watch your purse/phone whilst you go for a drink or to the toilet. Take them with you. 1.) When visiting cash machines be aware of who is hanging around you and try not to make it obvious if you are withdrawing larger amounts of cash. If you feel uncomfortable, cancel the transaction and find another machine. 2.) It is extremely rare to be a victim of robbery but if someone tries to take something from you by force, it may be best to let them take it. If you decide to try and defend yourself be aware your attacker may be stronger than you. It is often better to run away and shout loudly for help. 3.) Try to look and act confident, look like you know where you are going and walk tall. 4.) Stay alert – don’t walk along listening to music or talking on your phone. This not only advertises that you have this item but means you are distracted and less aware if someone approaches to try and take the item. 5.) It is a common misconception that women are more likely to be targeted by thieves whilst out and about. In reality, young males, on their own are the most common targets for street crime. Whilst walking between venues, stay with your friends and try to steer clear of any confrontations. Keep valuables out of sight. If you feel threatened or are a victim of crime, ring the police immediately. Burglar Behind Bars A burglar who broke into thirty homes in Crewe was sent to prison for four years. The man also admitted six offences of breaking into sheds and domestic garages, 21 offences of stealing from vehicles and an offence of theft by using a credit card. More Cannabis Farms Closed Police at Crewe urged people to report any building they suspect may have been turned into a cannabis farm, following the discovery of two in less than a week. Two hundred and fifty cannabis plants were seized from a house in Newfield Drive. Then 450 plants were recovered from a terraced house in Crewe town centre. The two crops would have produced cannabis with a street value in the region of £100,000. Dealer Jailed A drug dealer from Crewe, found with nearly £14,000 worth of cannabis bush in his possession, was sent to prison for eighteen months. And a 20 years old man was sentenced to 21 months in a Young Offenders Institution after admitting possessing cocaine with intent to supply in Congleton town centre. Both men were caught when patrolling Police Officers became suspicious about their behaviour. Street Problems Tackled Police in Nantwich dealt with seven people after a series of street disturbances during a busy weekend. Three men were bailed to appear at court, another was given a formal caution and three others were issued with fixed penalty fines. Welcome to this my thirty-first electronic news bulletin. Hosted a Parliamentary dinner on Bingo with fellow MP's and representatives from the Rank Group Ltd. ...This weekend I will be visiting the Nantwich Winter Wonderland with my wife Julia and children, where I will be opening the new Ice Rink at Residence Bar and judging the Best Dressed Christmas Stall Competition. I will also be attending the Musical Mayhem Cabaret in Crewe and the Wybunbury Conservatives' Christmas fund-raiser reception in Nantwich. Nantwich MP Edward Timpson has received the all clear from the team heading the inquiry into the MPs’ expenses scandal. Mr Timpson received a letter this week from the head of the inquiry, the former senior civil servant Sir Thomas Legg. This concludes the provisional findings that the inquiry had made back in October. Sir Thomas’s final report is expected to be submitted to the Members’ Estimate Committee (MEC) in mid-December. A SUPPORT worker who looks after elderly people as well as caring for a disabled brother at home has won the Crewe and Nantwich Carer of the Year Award. Kelly Harrison, senior support worker at Station House care home, won the trophy at the awards organised by Robert Smith and Son Funeral Services. A number of nominations were received and assessed by a panel of four independent judges. The award was presented by MP Edward Timpson at a ceremony at Crewe Hall. Kelly won a glass trophy, bouquet of flowers and afternoon tea for two at Crewe Hall. Most highly commended was Jean Dyde, a carer at Richmond Village in Nantwich. Highly commended were Gill Corns, chef at Cypress Court care home Crewe and Karen Potts and Gemma Mitchell carers at Cypress Court, and Maggie Ramshaw, a carer at Brookfield House nursing home Nantwich. PANTO stars are urging Crewe residents to back this year’s Santa Fun Run to raise funds for terminally ill children. The cast took time out from rehearsals at the Lyceum to join Hope House Hospice worker Alison Marsh to promote the event, which takes place on Sunday, December 13. David Lonsdale, who plays King Bumble in this year’s panto, Sleeping Beauty, said: “Over the last few years I’ve visited a number of hospices and am always struck by what lovely, cheerful places they are. The star of ITV’s Heartbeat has also said he will do his best to be at the event to see off the runners. Former Rainbow star Jane Tucker, who plays the good fairy Azuriel, said: “Anything to help with this sort of charity is good because it is so special. The run starts at 11am and is about one mile long. Hope House is in Oswestry but caters for many families in the Crewe and Nantwich area who have children with life-limiting conditions. Staff want as many people as possible to take part. Crewe and Nantwich MP Edward Timpson was one of the first to sign up. “I’m very much looking forward to the event,” he said. It costs £12.50 to register for the run but children are free and each adult can take along up to three children. Each participant will receive a pack including their Father Christmas suit. Every entrant is asked to raise £20 in sponsorship. Anyone wishing to enter the race should call into the Hope House Shop in Market Street, Crewe, or phone 01691 671671. Information is also available at www.santarun.org.uk. STAFF at an adult education trust have been honoured for their hard work. The Lady Verdin Trust, which provides support and care for adults with learning disabilities in Crewe and Nantwich, held a dinner and dance at Nantwich Civic Hall. The evening included a presentation which recognised the hard work of many of the trust’s staff. Edward Timpson MP presented 18 NVQ awards, while South Cheshire Chamber of Commerce chief executive John Dunning presented in-house training awards to 27 members of staff. For the first time this year, two STAR Colleague Awards were presented by Cllr Roland Domleo. Francis Cookson was named Team Member of the Year while Julie Thomas was crowned New Starter of the Year. Pat Mellor, Phil Sinclair and Jean Noakes achieved 10-year service awards – and Susan Cole, who has worked with the trust since it started, achieved 25 years’ service. The final award was presented to Susan Lady Barlow, who after 27 years’ service was retiring as a trustee. Might there be some fight left in the class war after all? The Tories are in mild shock following PMQs, they never expected Cameron to get clunked like that. Brown is clearly going to try and use Tory inheritance tax policy to ram home the message that a Cameron government will be a government of the rich, by the rich, for the rich. But the Tories are taking comfort from their belief that Brown’s ugly class war politics won’t work, pointing to how they failed in Crewe and Nantwich. But the attacks on Edward Timpson backfired, at least in part, because Timpson was a bad target. It is hard to portray someone as an out of touch, uncaring toff when their family have fostered 80 odd children and have a long history of local philanthropy. Considering this I think it would be premature to delcare class war totally ineffective because it failed against this particular candidate. Local employer Gist, a supply chain specialist, has launched a specialist HR and training business, Gist People Services, to provide vocational training to its employees, suppliers, customers and competitors. Edward Timpson, MP for Crewe and Nantwich, opened Gist People Services training academy in Crewe on Friday. The academy provides Skills For Life adult education in literacy and numeracy – with the opportunity to gain a certificate equivalent to GCSE A grade. NVQs, Skills For Life and CPCs are all offered including NVQs in Driving Goods Vehicles, Warehousing and Storage, Business Administration, Customer Service, IT, Management, and Team Leading. Many of the assessors are Gist employees working as drivers and warehouse operatives, meaning that they can truly relate to the working environment and practices of those who are undertaking their NVQ or Skills For Life training (Numeracy and Literacy), an unrivalled standard of service. Crewe and Nantwich MP Edward Timpson this week expressed concern over clear evidence that independent local newspapers are struggling to compete with town hall publications and council newsletters. He said that he was worried that local newspapers do not have the same level of resources at their disposal as taxpayer-funded council newsletters. To tackle this problem his party have pledged for tougher rules on town hall publicity spending, and the liberalisation of local government data for commercial and voluntary use, as well as closely scrutinising council publications to make sure they don't exceed their remit. Commenting Mr Timpson said: "Local papers, such as the Chronicle, bring communities together and are vital resources - they need to be able to compete on equal terms. Crewe and Nantwich MP Edward Timpson is “disappointed” by the new Ofsted report which shows that millions of children in the UK are still being let down by the quality of their education. The report goes on to detail a string of complaints from employers that many young people are leaving school without having mastered reading writing and arithmetic, the so-called 'three Rs'. Ofsted says that a 'stubborn core of poor teaching’ was evident in thousands of schools, perpetuating the gap between pupils from wealthy and deprived backgrounds. Commenting on the report Mr Timpson said: "Luckily here in Crewe and Nantwich we have some fantastic schools - Brine Leas was recently ranked 27th best secondary without a sixth form in the country. Every homeowner in Nantwich could have the right to home energy efficiency work worth £6,500 under a Tory government. That was the claim made by the party which plans to help households protect the environment and save money. The idea, backed by Nantwich MP Edward Timpson, suggests there would be no upfront cost as the work will be paid for by savings on energy bills from improved insulation. It will save families money and make Crewe and Nantwich’s homes warmer in winter, Mr Timpson said. And he claimed that a typical home could see £30 a month knocked off its final bill. The plan also includes working with councils like Cheshire East to promote a ‘points for recycling’ scheme. Points are converted into vouchers for shops including Marks & Spencer and Costcutter, or into donations to charities. Households could earn up to £175 a year in vouchers. THE Lady Verdin Trust celebrated its annual dinner and dance at Nantwich Civic Hall on Thursday. The group is an independent provider of support and care for adults with learning disabilities in Crewe and Nantwich. The event was attended by more than 300 people who work or are associated with the Trust and included an awards presentation. Crewe and Nantwich MP Edward Timpson supported the event by presenting NVQ awards to 18 members of staff. Chief Executive of South Cheshire Chamber of Commerce John Dunning presented the Support Assistant General Awards, the Trust’s two-year in-house training programme, to 27 members of staff. And, for the first time this year, two Star Colleague Awards were presented by Councillor Roland Domleo. Francis Cookson was named Star Colleague Team Member of the Year and Julie Thomas won the award for New Starter of the Year. Other awards were presented in recognition of long service – Pat Mellor, Phil Sinclair and Jean Noakes achieved ten years service and Susan Cole, who has worked with the Trust since it started, achieved 25 years service. The final award was presented to Susan Lady Barlow, who after 27 years service was retiring as a trustee. Crewe and Nantwich MP Edward Timpson has hit out after a new Ofsted report shows millions of children are still being let down by the quality of their education. It found almost a third of schools are ‘mediocre or worse’, while almost half of Labour’s flagship academies are failing. It details a string of complaints from employers that many young people are leaving school without mastering reading, writing and arithmetic. Ofsted blames a “stubborn core” of poor teaching in thousands of schools. Mr Timpson said: “Luckily here in Crewe and Nantwich we have some fantastic schools. “Brine Leas in Nantwich was recently ranked 27th best secondary without a sixth form in the country. “But this report shows that some schools, particularly in poorer areas, are failing our children badly. CREWE and Nantwich MP Edward Timpson have pledged his support to local newspapers. He has expressed concern over evidence that independent local newspapers are struggling to compete with town hall publications and council newsletters. He said he was worried that local newspapers didn't have the same level of resources at their disposal as taxpayer-funded council newsletters. Mr Timpson said: "Local papers bring communities together and are vital resources - they need to be able to compete on equal terms. "Detailed and informative council papers are useful, but they shouldn't encroach on independent media, and drive them off the shelves. "With these new rules there will be room for both."